As the leading graffiti tourism company in Chile (we love the sound of that), we have created a method for visitors to identify where they're standing. Now, the city hall liked the idea and they have also determined the same areas, but remember that this isn't carved on stone... if you tell someone "Hey I'm looking for, like, district one... most locals will probably say: "Whaaat? What are you talkin' about, Willis? " So, remember that if you're going to use this terminology, ideally is with us or with our guides. 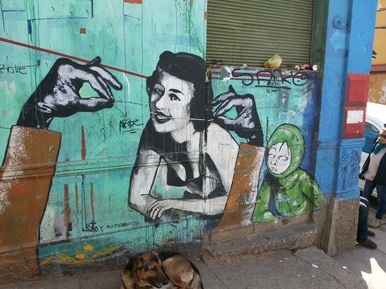 Barrio Puerto is the place where Valparaiso's night time stories are endless. This was the old hang out area for Sailors, and their "hourly girlfriends" back in the 50's and 60's. The place is a box o' chocolates, as Forrest Gump would say -- you can either have the best time of your life or end up smelling like fish (those that forgot to bathe). Cerro Carcel is where we developed our first route in 2011. We've had a million and one adventures here, as we take people through an area relatively close to the most touristy area in Valparaiso, but light years from being touristy (This being a great thing). District 2 is the touristy area; therefore, it is one the safer areas of this port city where you can wander around and see some great works. This district is also where many artists try to showcase the best of their work. Some great pieces are found here, such as the one in the picture. District 4 is one of our favorite areas for both legal and illegal styles of Graffitis. This is one of those areas you probably should not wander around by yourself, but they have some very cool hidden gems, which we love to mix with views of amazing architecture. "Going All City" and "Cyclepaths"
Polanco is the hill where, in 2012, a few of the girls from the "Crazis Crew" had the amazing idea to host a Graffiti Festival. The Microrayon is what we call the Larraín, Lecheros, and Baron Hills. Two brands hosted festivals in these hills and now they are full of large scale murals. Some of these areas (Polanco to be precise), were areas that needed intervening and some joy, through the use color, as they were called "Social Risk Sectors". 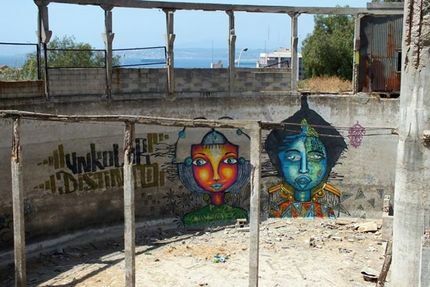 Nowadays, many people go to the Polanco Hill to see this huge open air graffiti museum. Can you affored to miss it? No. If you do, your life will never be the same... But be very careful with your personal belongings, because this area is not the safest.